A scary beautiful, handmade unique for all the zombies, monsters, ghosts, witches and demons. 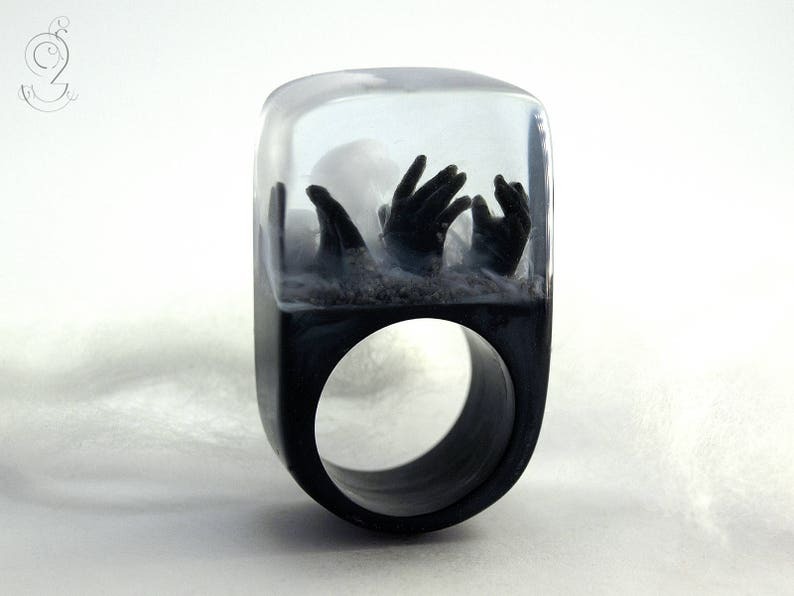 On a black ring with grey stones and spooky fog three black hands are coming out of the earth. The ring is very light and despite of the size extremely good to wear. Moreover it is a hand charmer and always an eye-catcher. This ring will be produced suitable for you (I need about three weeks for the production). Please specify your ring size (you can measure the inner diameter from a ring which fits). Not a problem at all, a new ring is produced in about three weeks. Zunächst eine sympathische Betreuung durch die Künstlerin. Außerdem verursacht der Ring genau die erwartete Aufmerksamkeit. Alles wie erhofft. Gerne wieder. OMG!! Too creepy! Perfect for Halloween, or any time you're feeling ghoulish!! In order to exercise your revocation right, you must inform us (Isabell Kiefhaber, Bulkesweg 89, 73230 Kirchheim unter Teck, Telephone number: +497021738678, E-Mail address: mail@geschmeideunterteck.de) of your decision to revoke this contract by means of a clear declaration (e.g. a letter sent via post, fax or email). You can use the enclosed specimen revocation form for this, which however is not mandatory.